Yes, that looks very odd – how can it be? The answer to this little conundrum serves as a reminder of how rarely the early printed book we hold in our hands is in its pristine condition: it usually bears the marks of its changing fortunes. So, even when the boards of its binding are made of the original leather, the spine may have been replaced; even if the whole binding was as it was when first provided for the volume, the flyleaves or pastedowns with which it had been provided may have been removed – as the many guardbooks of fragments in libraries across the country bear witness, there was a vogue for doing this in some libraries in the late nineteenth and early twentieth century. In those cases, of course, the fragments are preserved, though often the details of its previous host volume were not recorded and so that reconstructing from where they have been extracted can be a challenge, but not, as we are about to see, always impossible. The compiling of a guardbook was not a practice imposed upon the Harsnett collection, which is the focus of this pilot project. Despite that, some of the fragments which were once present have now disappeared. Yet, even in a few of these cases, it is possible to reconstruct what now does not exist. This is because the ink of a fragment – particularly when pressed close to an adjacent piece of paper or board – is liable to leave an impression on its neighbour, what is known as offset. That impression will, obviously, be in reverse and so the traditional method for attempting to read it involved using a small mirror (every palaeographer needs their vanity case). Digital technology provides a more efficient solution, as one recent discovery demonstrates. 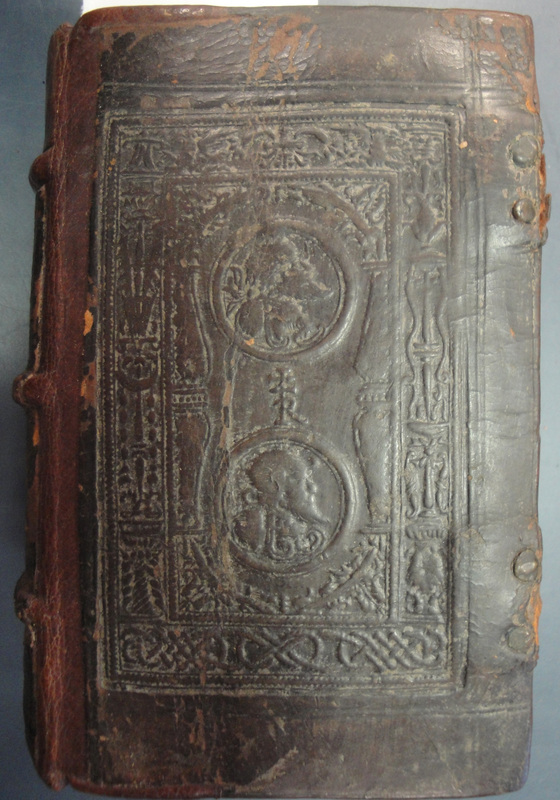 The volume which now has the Harsnett shelfmark of I.b.18(1) retains the covers of its blind-stamped panel binding, identifiable as the work of the London printer, John Reynes. However, the spine – as with many Harnsett volumes – is not original and would seem to have been replaced as part of the campaign of conservation which took place at the beginning of the 1970s, while the collection was housed in Colchester Public Library. In most cases, the bindery doing the repairs retained the endleaves to be found in the volume. In this instance, though, they were either removed or were already absent: there is no fragment now in place. 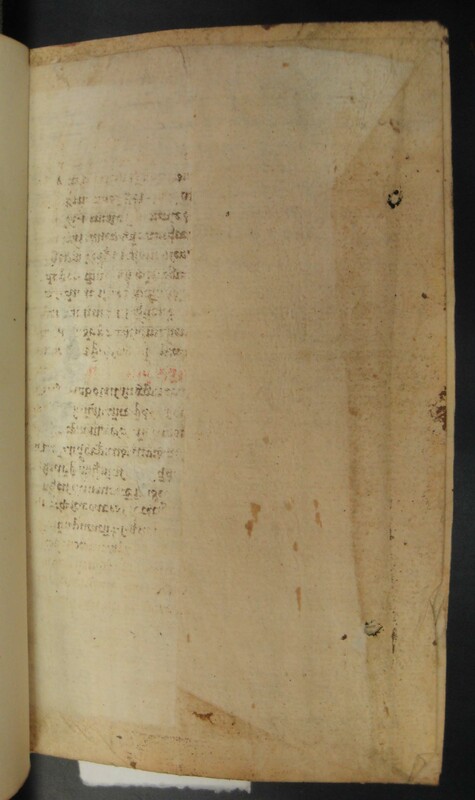 At the same time, we can be certain that there had been at least one present because the final original flyleaf has on its verso offset from a previous binding strip. 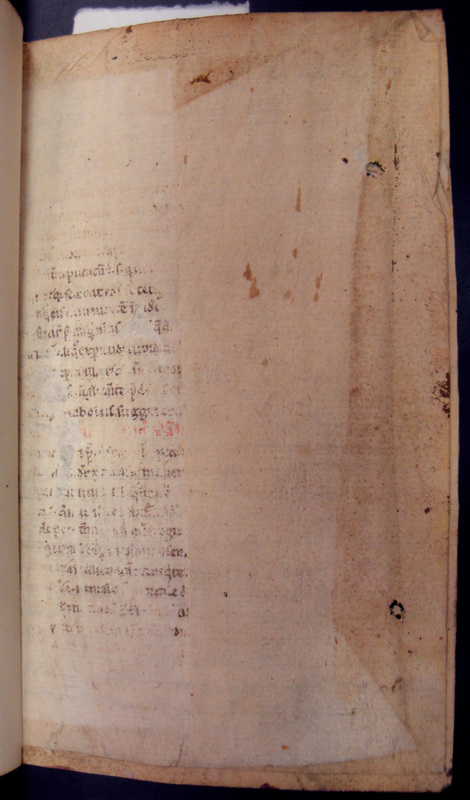 The strip had been placed upside down to the book’s orientation, and the impression left on the adjacent leaf is, of course, reversed. It used to be the case that the way to read offset was to use a small mirror, though it is doubtful whether that method would have made it possible to discern the text here as the impression is faint and intermittent. This is where Photoshop is a god-send for such research: import the digital image and manipulate it – inverting and reversing the image, enlarging and shifting the contrast and levels, and it becomes possible to discern at least some of the words, even to be able, with some guesswork and the assistance of on-line databases, to identify the text as a section of Peter Lombard’s Sentences. As enough of the script is now visible to judge it to be from the last years of the twelfth century, we can also comment that the manuscript of which an element was once present in this binding was from an early copy of Lombard’s popular text. It is in the nature of this project that its sources are half-living but, as this example shows, the research sometimes takes on the character of chasing ghosts.